Abigails Hostel is a modern hostel in the very centre of Dublin, with bright and airy common areas and a lift, along with electronic security passes. Many Hostelworld guests have rated their free breakfast very highly, citing the rotating variety of available yoghurts, eggs, croissants and scones. 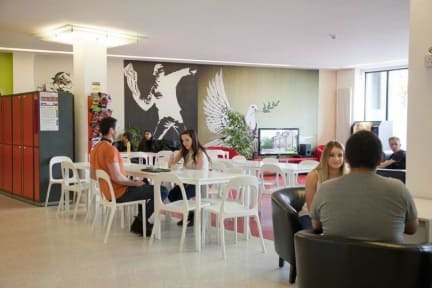 No matter what your own age is, you can find a wide range of visitors in this hostel, from families and older travellers to young backpackers and school groups. Very good hostel with great breakfast! Love this hostel! Great location, right next to SuperValu supermarket and near AirLink bus stop for airport. Only downside is there is no laundry facility and it’s quite large but very lovely! Stayed here for one night and enjoyed my stay. Staff were superb! I had to get an airport shuttle early in the morning and they helped me book it. Wish I had more time the enjoy the facilities as I was only there for one night. Would reccommend. Great stay, really friendly reception, beds were comfy and clean. Breakfast provided and a good selection. Bathrooms had a full tub—a little different than most hostels I've been to but it was kept tidy. Great location, close to airport bus, the tourist trap Temple Bar area, but also good pubs that locals frequent and walking tours. Fantastic location! Good WiFi. Great breakfast- as long as you get up early for it. Had 2 kinds of yogurts, hard-boiled eggs, scones, muffins, cereal, toast, different fruit juices, and oats. It goes quickly. There was an overbooking problem twice in one night (we had to be woken up at 12:30 am to determine who everyone was) but it was a quick inconvenience. The kitchen is stocked well. The shower could benefit from a shelf of some sort to hold your toiletries. All in all, great place. Excellent location, friendly staff, yummy breakfast, and a shuttle service to the airport. I loved staying so close to the river and Temple Bar. I highly recommend. Great location, ample and good-tasting breakfast. The signs suggesting lockers and safe-deposit boxes instead of in-room safes for storing valuables left me feeling slightly insecure! My room was clean as was the bedding, but the bunk and pillow felt “industrial.” Unfortunately the place was full of a French school group on holiday so I didn’t get the “interesting traveler” vibe I had hoped for.